The background in the photos I've been taking of Mia is actually her crib sheet, available here. Jeff and I have been parents now for a whole month (!!!) and so obviously are now experts and have a lot of opinions on baby gear. In addition to what we registered for, we got a lot of hand-me-downs from Jeff's baby sister as well as borrowed a few things from my sister, so we've gotten to try a lot of different things. Now, of course, every baby is different. What worked for us might not work for you. But I thought I'd share what we're loving so far. 1. Matimati Baby Bibs. It turns out, most bibs don't seem to really work, they're too thin so liquid soaks right through them. These are super thick and have a double layer, so they actually keep Mia dry when she's eating out of a bottle and letting milk run everywhere! Plus they don't go over her head (baby trama alert) or have velcro. It turns out you don't want velcro on your baby gear because you have to wash it often, and the velcro will stick to other things in the wash and ruin them. And these are so adorable and have great patterns - definitely keepers! 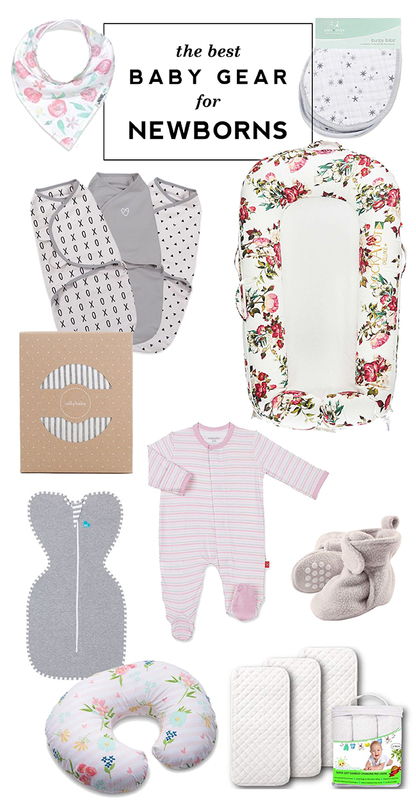 2. aden + anais Burpy Bibs. These are also bibs for when the baby gets older, but when they aren't snapped they're actually huge burp cloths! They are the only ones I reach for at the moment, as they are actually thick and absorbent (very important when you have a particularly spitty baby!) plus they contour to better fit your shoulder and are big. I'm considering buying more of these as I'm constantly washing them to have one on hand! 3. SwaddleMe Original Swaddles. I'm pretty dexterous so I thought I'd be able to swaddle with blankets no problem. Nope nope nope, it turns out swaddling blankets are the worst and babies can break out of them no problem and then wake themselves up and get mad. We have a ton of different types of swaddling blankets that were hand-me-downs so we got to try out a lot of them, and these were hands down the best for right when we got home from the hospital. You just have to pin the baby's arm's down and velcro, and voila, you're good to go! The small/medium size did only work for Mia though for as long as she fit into newborn clothing, as soon as she was too big she was able to snake her hands out again. 4. DockATot Deluxe+ Stage 1 Dock and Cover. I bought this last summer on impulse during the Nordstrom Anniversary Sale, not knowing too much about it but hearing from a few bloggers that they loved them. Then I looked it up and saw that the safety guidelines are basically that you aren't supposed to let the baby sleep in it unless it's on the floor. I was worried we wouldn't ever actually use it, but oh my goodness was I wrong. She's basically in it whenever she sleeps during the day. We decided that she is okay to snooze in it on the couch when we're in the room with her, and she will sleep in it for hours. I think it must be super cozy, like being held. It means we can actually get stuff done instead of just holding her all day! It is hands down the best baby purchase we've made. 5. Solly Baby Wrap. We've used this wrap a couple of times to hold Mia when we go out to eat, and she falls asleep basically instantly when we put her in it. She just gets to snuggle with her mama in there! I was a little intimidated to try to get her in there the first time as I've heard other moms say they don't feel like the baby is secure. The trick is to just make sure the wrap is really tight on your body before you put the baby in. I definitely recommend watching this video on how to tie it on repeat before you give it a try! I'm planning to use this more now that Jeff is back at work for when I need to run down to CVS or a coffee shop, as it's less of a hassle than getting her down the stairs with her stroller since we live in a fourth floor walk up. 6. Love to Dream Swaddle UP. When Mia got too big for her SwaddleMe swaddles, we tried a bunch of different ones again and found an immediate favorite in this one. It allows her to be swaddled with her hands up, which is how she sleeps when she isn't swaddled. In this swaddle, she can self sooth by putting her hands in her mouth. She has managed to sooth herself back to sleep when wearing it, and has done some 6-8 hour stretches in it! 7. Magnetic Me Footie. These onesies are magical. Instead of snaps (hard!) or zippers that bunch up, they close with magnets! We just have one, but I've been washing it repeatedly so we can use it at bed time. 8. Luvable Friends Booties. It turns out, no baby socks stay on. Parents had told me this, and yet I did not believe them, but it's true. No baby socks stay on. These booties actually do! They can go on over socks or replace socks to keep babies toesies warm in the winter. 9. Boppy Pillow. This works perfectly for keeping baby in place for breastfeeding and means I can actually keep one hand free, you know, for scrolling Instagram. I recommend brining it to the hospital with you so the nurses can show you how to position your baby for breastfeeding with it. 10. Changing Pad Liners. It turns out, Mia likes to pee right when I try to replace a dirty diaper with a clean one. We have these on top of the changing pad so that when she inevitably gets things messy, I can just pull one off and put it in the wash instead of having to wrestle with a new changing pad cover each time. We have six total of these and can regularly go through all six in two days. 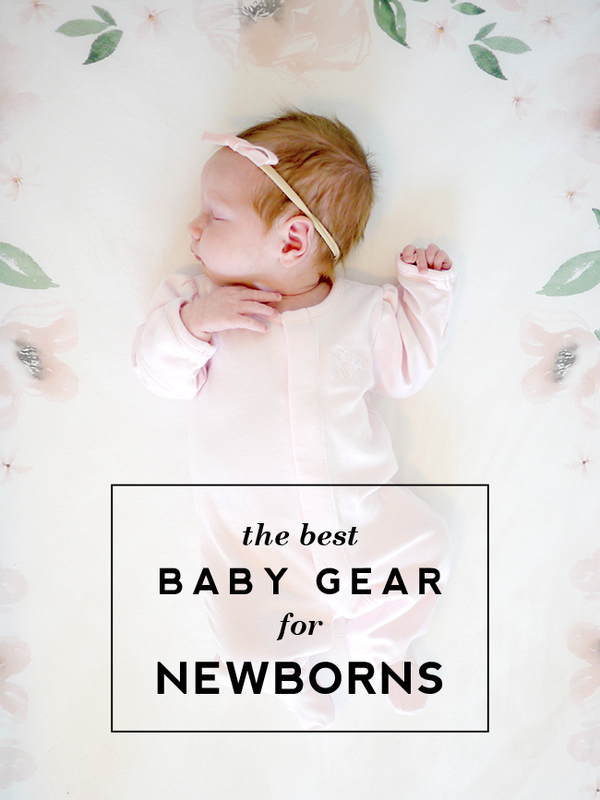 Do you have any baby gear must haves that we should check out? Let me know!